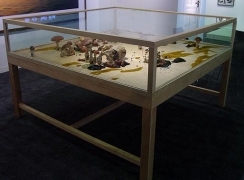 James Cohan Gallery is pleased to present a group exhibition featuring work by Vito Acconci, Ingrid Calame, Nam June Paik, Roxy Paine and Hiraki Sawa. Vito Acconci's early performance works of the 1970s explored the psychological boundaries of the body and architecture. The dynamics of intimacy and power have informed his entire career. After a decade of performance-based work, Acconci shifted his emphasis in the mid 1980s to architecture and its psychological ramifications. 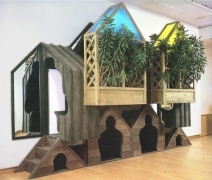 In Houses Up The Wall, 1985, viewers are invited to enter and sit inside the facade of a house-like structure that is affixed to the wall. The openings and interior benches are silhouettes of the human form in a near-fetal position. The lower benches have mirrors placed to the sides. The reflection completes the silhouette of the human form as well as displacing the interior with the exterior. As one climbs into the upper bench area of the work, they are crouched over and facing the wall. It is at this point that the participant engages in Acconci's implicit dialogue: the difference between public and private and the connotations of home as habitat or nest. In Ingrid Calame's new drawings she has extended her activity of tracing stains from city streets and begun incorporating tracings of graffiti and paint spills found on the concrete embankment of the Los Angeles River. Like the randomness of the stains, the graffiti, old and new, is a collision of voices. The layered graffiti on these walls become a grand and anonymous conversation of fractured thoughts and images. Time and the elements erode the various markings; Calame has seized this conflation of markings, reclaimed them from a chaotic state and given them her own unique order. Calame's new work weds her prior ideas with an increased emphasis on entropy found in the urban terrain. As each traced silhouette is assigned a color by the artist, she has meticulously reanimated the detritus of our entropic landscape. Her abstract topographies emanate the richness of a collective consciousness of the built world and those that inhabit it. Hiraki Sawa is a young Japanese artist who is best known for his surrealistic and poetic video animations. 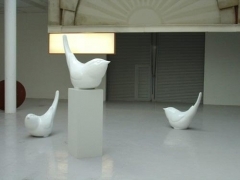 Sawa has created an installation titled Stopped Things Can Be Seen Between These that consists of five cast birds modeled from a small porcelain figurine of a wren. 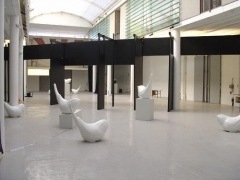 In several of the cast sculptures, sound emanates from their interiors. Unlike his videos, where characters, objects or model airplanes are animated in a space, Sawa has created a still and contemplative environment in which movement is implied as a result of sound. The space between the forms is animated by auditory sensation. The video art pioneer Nam June Paik coined the phrase "The Global Village" over thirty years ago. His inventive use of the television monitor, combined with found sculptural objects and video footage, has enabled him to conflate many sensibilities, ranging from high and low culture, in a single piece. Elephant Gate, 1995, epitomizes the notion of "traveling by video and not by cars," as Paik so presciently observed. An ornate Southeast Asian metal gate frames the 43 monitors with multiple candle holders. While the candlelight illuminates the gate, the monitors have three different video feeds of Paik's high velocity graphic video imagery. The footage includes multiple views of Indian sculpture, Indian television and tourist postcards of Southeast Asia. The relationship between order and chaos and reality and artifice are critical to Roxy Paine's oeuvre. His work is a meditation on our ever-evolving natural and built environment. A v.s. 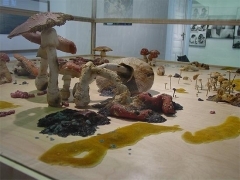 B, 2005, is a large vitrine in which various forms of fungi - including Amanita Muscaria, Wolf's Milk Slime, Orange Poria, Psilocybe Mexicana, common house mold and Penicillium - co-exist in a state of entropy. The competition of natural forces has created something both ominous and beautiful. Misnomer, 2005, is a new work from a series of hand built stainless steel trees that Paine has made over the last four years. Reflecting on the place where nature and industry collide, Misnomer is an elegy to the life cycle and to the notion of change. There is an inherent dialogue about impermanence, stuck in perpetual winter, never blooming and never dying.